It's hardly surprising with so many wonderful gift ideas now available for our canine friends: from custom accessories to themed treats and pink cuddly toys not to forget bespoke gifts for dog lovers, here's what we love for Valentine's Day! Every collar at Collar & Ruff is 100% made to order, completely by hand, from a single piece of leather so your collar will be truly special to your dog. 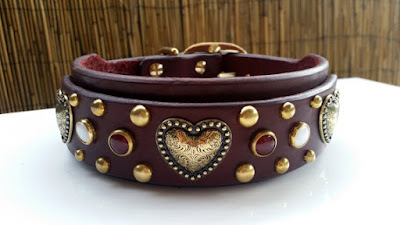 The stunning Heartbreaker design by Collar & Ruff is a dual layer collar (50mm wide) with a 38mm top layer decked out with heart conchos, gemocite stones and matching studs. 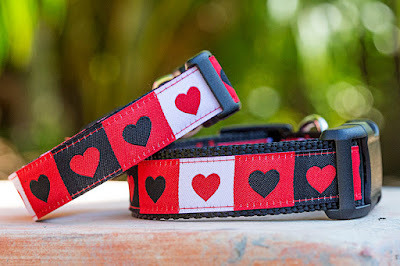 This beautiful handcrafted Valentine's Day Heart dog collar from Dizzy Dog Collars is made to order in Brisbane. This handmade item uses strong but soft nylon webbing plus a stunning woven jacquard ribbon, finished off with a high-strength side release buckle. A matching lead is also available. Available in 7 sizes. 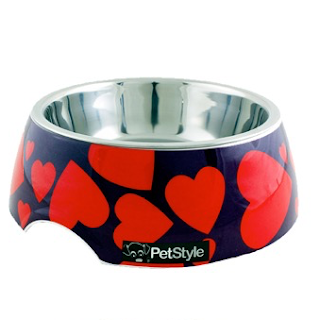 This Australian-designed Joseph Lyddy PetStyle cute dog bowl features a red heart on a purple background. This non-slip melamine dog bowl contains a stainless steel insert, which makes cleaning in the dishwasher easy. Having used one for well over 12 months, we can vouch that it is hard-wearing and the best part has to be its price! Available in Medium or Large. RRP: $16.50 at selected COLES stores nationally. The PlushMat! 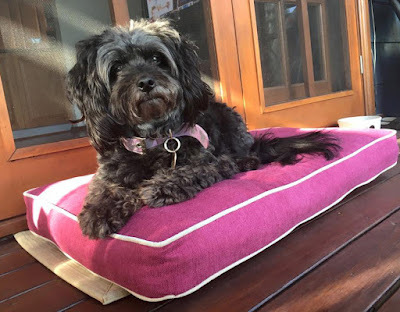 is a luxurious, supportive and stylish range of indoor dog beds made by Rover Pet Products in the Hunter Valley. You can customise your PlushMat! to suit you own style. Simply select from one of four sizes and ten on-trend colours then finish off with a contrasting piping colour for a touch of class! This dog bed is water-resistant and easy to wash but is recommended for indoor use only as it can get dirty. The Rogz Luna Podz Dog Bed in Pink Heart will make your pooch feel like royalty with its stylish silver-embroidered design. 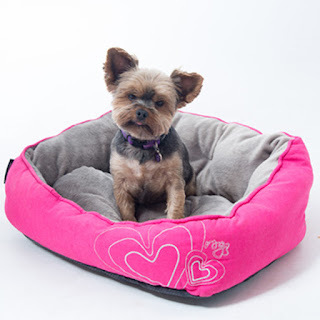 This super soft designer bed is destined to get your dog into the sleep zone, and comes with a reversible cushion that can be easily machine washed. Suitable only for toy or small breeds, it is available in small (48cm) or medium (56cm) sizes. 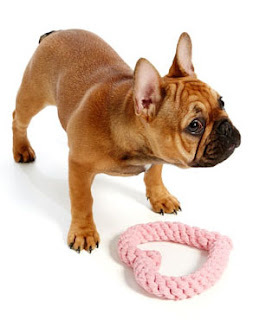 Dogs love toys that squeak, but soon lose interest when the "music" stops! 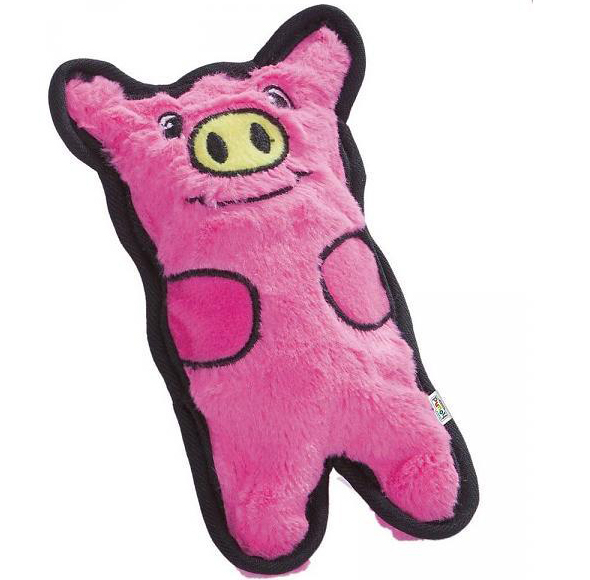 If your dog loves to seek and destroy, give him long-lasting fun with this Invincibles Squeaker Pig dog toy! The new improved design features double-layered seams and with its Dura Tuff material, this toy will keep on squeaking even after being punctured. This single-squeaker pig is approximately 12-15cm in height. Australian designer Peter Alexander loves to spoil his dogs and this inspired him to create the PA Pups collection of dog accessories. Your dog will fall in love with this cute new rope dog toy! Crafted in a 100% cotton rope, this love heart-shaped toy is the perfect gift for your pet this Valentine's Day. No doubt our doggies have been spoilt over Christmas but there's always room in the toy box for one more plush toy! 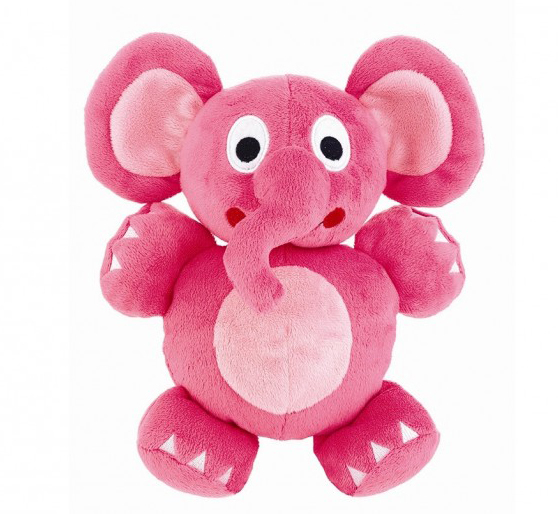 Elli the Pink Elephant is a super plush dog toy with crinkly ears, a squeaker and shaker inserted for hours of enjoyment and companionship for your dog. Be careful if you have kids, because they may want one too! Available in Mini (16cm) or Large (24cm). The Dexil luxury range is brought to you by Friendly Dog Collars who also offer a colour-coded range of collars, leashes and harnesses spelling out your dog's temperament to the world. 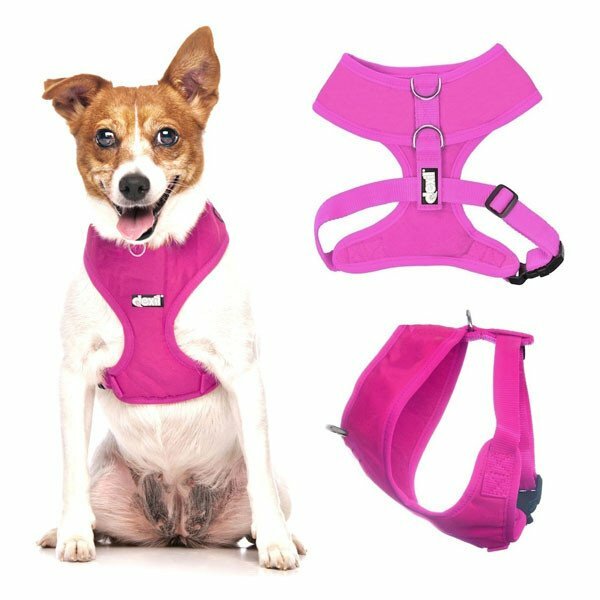 This Candy Pink Vest Harness is padded for a comfortable fit and waterproof. It is also easy to put on: simply slip the harness over your dog’s head and fasten the girth strap. Made from high-quality soft polypropylene fabric for maximum durability so you can throw it in the washing machine. Available in 4 sizes. Just because dogs should not eat chocolate does not mean they can't have their own box of treats on Valentine's Day! 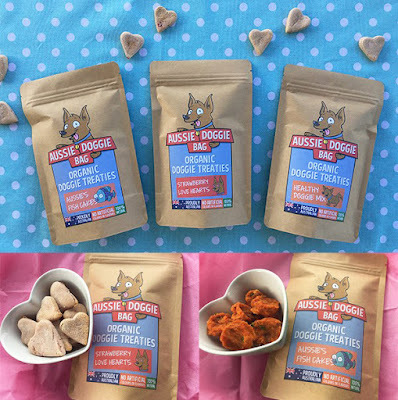 These home-made dog treats by Aussie Doggie Bag only use human-grade ingredients and the selection changes every month! 1 bag (200g) of "Healthy Dry Mix" to add a nutritious boost and some excitement to your doggie’s everyday food! RRP: $35 per box at www.aussiedoggiebag.com.au (includes delivery Australia wide). Are you looking to spoil the furry love of your life? 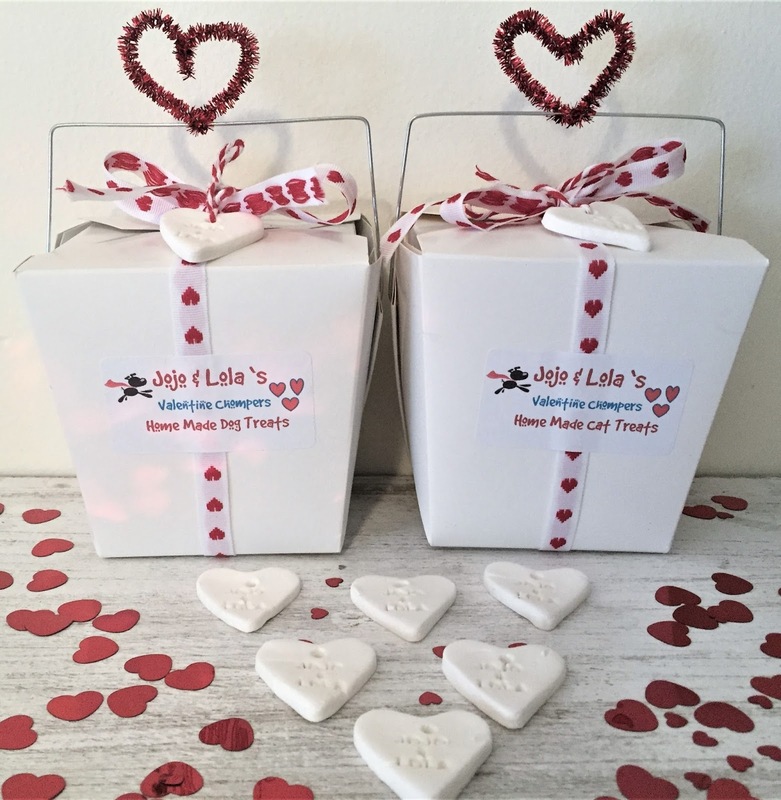 These pretty Valentine noodle boxes from Jojo & Lola's Jerky Chompers come with a love heart ribbon and a handmade heart-shaped gift tag and are available now to make your pet's Valentine’s Day extra special. Filled with your choice of dog or cat treats, they can be shipped by Express Post Australia-wide or you can collect them for free at one of the Brisbane markets. 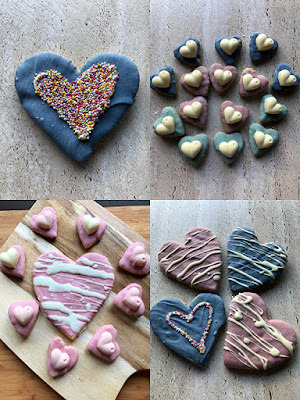 Just in time for Valentine’s Day, the Doggie Hearts Pack from Laila and Me will melt your canine friend's heart with its selection of Giant Heart Cookies plus six small biccies. 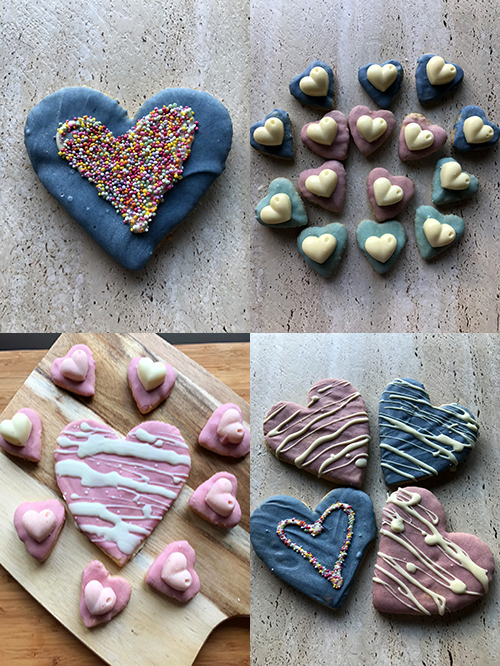 All these treats are made with buckwheat flour, homemade peanut butter, coconut oil, eggs, unsweetened yogurt drops and food colouring. Also available are pupcakes, barkday cakes and Laila and Me can run custom pet events where they do everything for your pet’s special celebration! 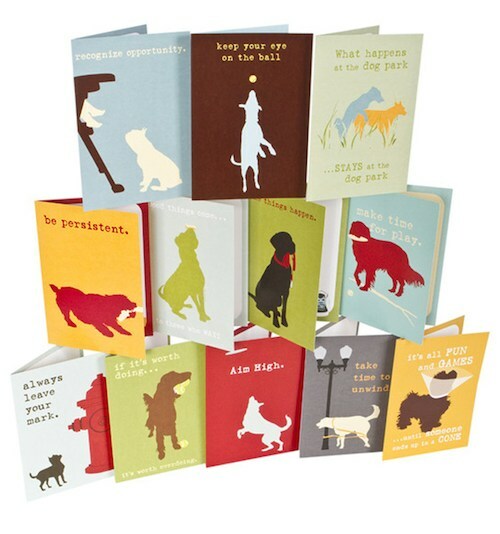 These Inspired by Dog greeting cards are full of sage doggie advice such as “Make time to play”, “Keep your eye on the ball” or "Aim high". Each card measures 18 cm x 13 cm and comes with an envelope. These fine silver pendants from Silver Pet Prints are the perfect way to capture the paw prints of the furry members in your family and keep them close to your heart. Handcrafted in a variety of shapes, your pet’s paw print will be showcased on your choice of a stylish sterling silver chain with their name stamped on the back. If you have more than one pet, you can hang two same sized pendants on one chain, or choose two descending pendants. This is a unique gift for the dog lover in your life! Enter our latest competition here before 9/2/2017 to win one of these! A custom portrait of your pet is a wonderful way to celebrate him/her and decorate your home and it also makes a great and meaningful gift. 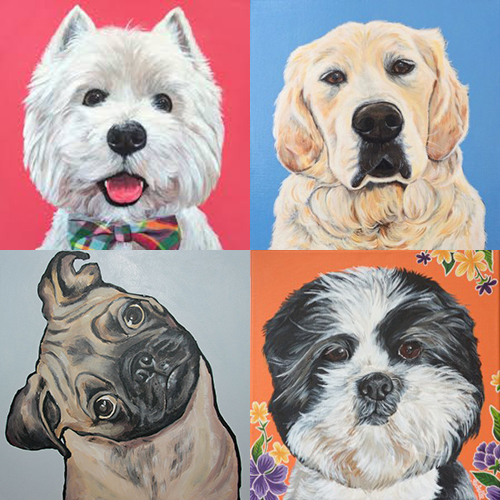 For her paintings on canvas or board, artist Michelle Phong works from high-resolution photos that best capture your pet’s personality. She uses acrylic paint on canvas with a finishing layer of protective water proof varnish. You can also select the background colour to suit your home decor. You can choose from four different sizes and Michelle also offers digital drawings as a more affordable option. This Valentine’s Day why not give the gift of time? 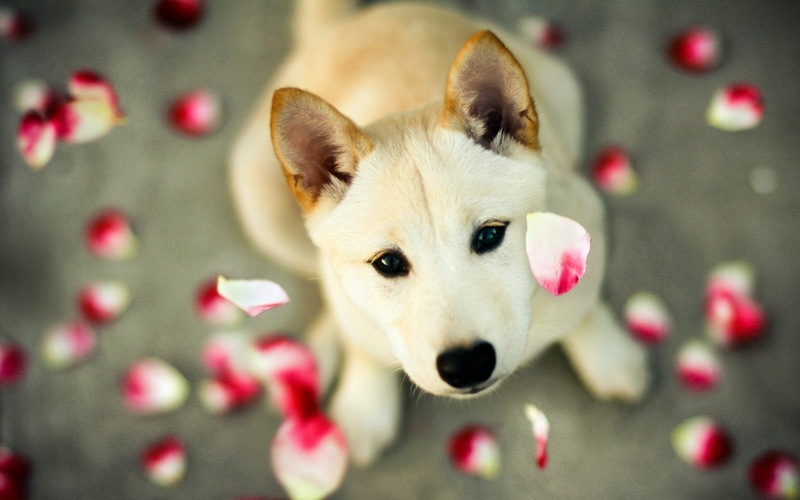 If you know a couple who has recently brought home a puppy or rescue dog and spends all their time looking after the dog, then you know a couple who probably won’t be going out for a romantic dinner! 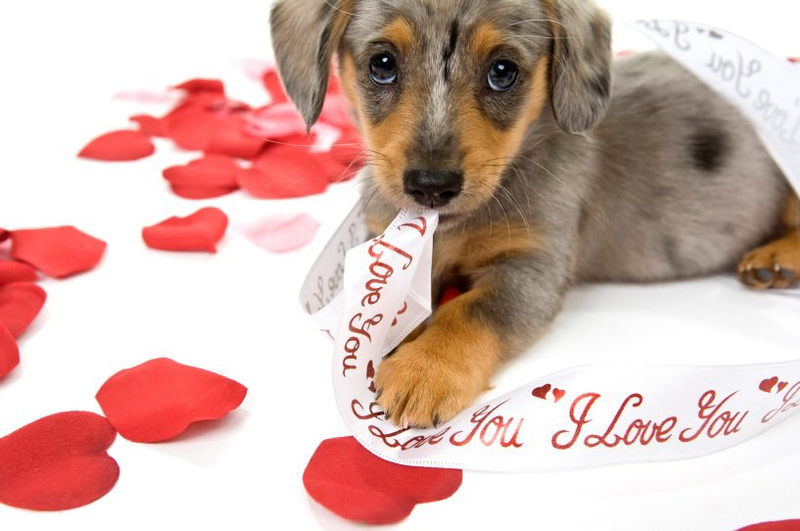 Give the gift of love on February 14th and let someone you know take a break from doggie parenting. It won’t cost you a thing, and you get to play with a dog all night, what’s not to love?